Monty Roberts Join Up can only be fully benefited from when it is employed within the context of the experiences and complications of each individual horse. 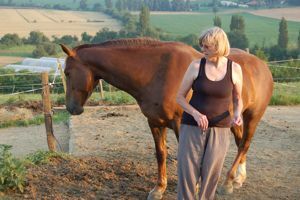 This is the story of a Monty Roberts Join Up experience between my mother and her six year old mare Jasmine. We bought Jasmine at the local horse fair as a four year old, in a state of chronic malnutrition. She wasn't quite a case for animal welfare, but almost. looking beyond the lack of muscle, and body fat and the dullness of her coat, we could see she had lovely big, strong joints and a strong, well constructed frame. She also had a very sweet nature and she made a connection straight away with my mother. After a few months she was well on the way to a complete physical transformation, and when she was strong enough we began a long, gradual program of lungeing until her 'ring' musculature developed enough for her to carry a rider. We started her under saddle as if she had never been backed, although we were told she had been, and she was calm and willing in her work. We took her out on hacks with the other horses in order to familiarize her with the aids before asking her to cope with the intensity of work in the arena under saddle, and gradually she became ready to start working in engagement. This was when the first sign of damage in her neck became apparent and after that it took another year or so of Cranio-Sacral Therapy and careful work to release all the layers of restriction and for Jasmine to heal the ligament and muscle damage. The reason it took such a long time to restore her to health was because she had birth trauma in her craniovertebral junction which was aggravated by an injury or damage possibly related to her early work, all of which will have been further exacerbated by the fact that she was in a very weak physical condition during her main growth phase, so there certainly weren't any resources left over for healing herself. 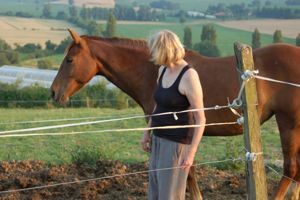 At the time when the Monty Roberts Join Up was undertaken, Jasmine was in the peak of physical health, she had been having a fairly long rest with the herd, and she was ready to address the psychological issues she had relating to people. Incidentally, the Monty Roberts Join Up session was not 'arranged' for that day, although we had been aware for a while that Jasmine was pushing the boundaries a bit. This particular day, all the horses had been fed on the lanes, and they were starting into they hay. 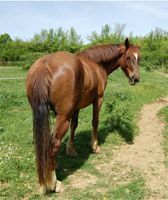 Jasmine was in a place where she had several choices of where to go and eat, but instead of just going calmly to eat somewhere, she tried to trap another less dominant mare in a corner and kick her, right beside where my mother was standing. Clearly demonstrating her lack of respect for my mother and an unnecessary aggression towards the other mare. The first stage of Monty Roberts Join Up was then to chase Jasmine out of the herd, beyond the hay. 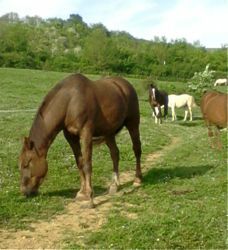 this was easier said that done as Jasmine is a powerful, agile mare and she was surrounded by the other horses. The lane construction of our Paddock Paradise, however, is perfect for such occasions, as it is narrow enough to prevent the horse from coming back into the herd, and even when Jasmine pushed back through, it was just a case of sending her out the opposite end of the lane, away from the other horses again. The other horses understand very well the scenario, and will interfere only rarely. For example, later on in the second phase of the process, Jasmine's best friend tried to distract her and lead her away when she could sense a change in the hierarchy was going to take place. Performing the Monty Roberts join up in this way, surrounded by the whole herd, is particularly powerful because the new rapport is integrated into the whole herd hierarchy. When Jasmine had been pushed past the herd, and she forced her way back and was sent out the other end, she then dropped her head and licked and chewed. Then my mother stopped and turned slightly away from her to indicate she had accepted the submission. The situation was delicate now, and required careful communication. Jasmine understood very well the request/demand my mother was making, but she was very unsure of the possibility of accepting a person as a leader. She expressed this doubt by looking unhappy, refusing to approach and shaking her head at the moment she would have joined up, had she been willing to do so. When Jasmine switched off from the situation and seemed to be falling asleep, my Mother gently pushed her back further away from the herd, and when Jasmine gave submissive signals again, such as giving her attention and expressing a desire to connect, my mother would become very still and relaxed and open (see series of photo's below). She also thought about expressing to Jasmine her own willingness to take responsibility a leader, and made sure she was feeling like someone who could be trusted and followed. Jasmine made the approach, but only to slide past and seek out the hay at the last moment! My Mother responded by pushing her back down the lane again - back to the original stand off. This reaction prompted us to think about the scenario in terms of Jasmine's individual life experience. It is all very well to perform Monty Roberts Join Up on a horse and demand that you become that horse's leader because you are stronger at that precise moment, but that may not be enough to convince many horses, whose previous experiences have created such a breach of trust between them and people, that proof of strength in this person now is not enough for them. In this particular case when we thought about it we realized that Jasmine was kept on her own before we bought her, and she was kept in a small patch of ground with no grazing, and fed vegetables and very little hay. 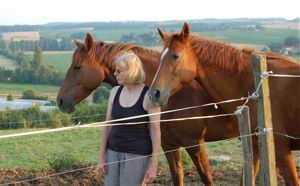 When she came to us, she had a herd of ten other horses and all the hay and grazing she could possibly need. In her mind, people were associated primarily with hunger and loneliness. 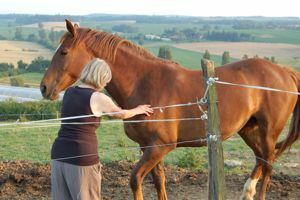 Horses are exceptionally sophisticated in terms of their comprehension of energetic and emotional interactions, but when it comes to rationality and logic, they have very limited capacity. Another very important element of her perception of things was that she held a certain resentment against people, which is completely understandable when you take into account how she was neglected. These reflections made us realize that to gain her trust, Jasmine must understand that people and food are not mutually exclusive, and in fact, people are the source of food. 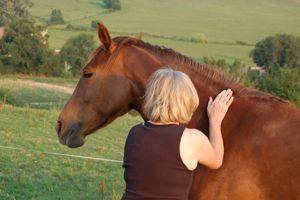 It is important that we make ourselves a positive association in the minds of our horses, and not the harbinger of loneliness, pain and other forms of suffering. Our philosophy about healing such issues is that recognition is pretty much everything - "If you can feel it, you can heal it" and simply explaining to Jasmine that she didn't have to choose between the food and her, and that in fact she was the source of the food, was enough to set up a different relationship between them. She then positioned herself so that if Jasmine wanted to go to the hay, she would have to go with my Mother, not past her, in order to get to it. At this point Jasmine's best friend Ellora came between Jasmine and the hay and created a diversion by spooking at something, because she had been sensitive to the change Jasmine was making in her view on life. Ellora is another mare who had also suffered a terrible neglect and ended up in a rescue centre, so she had her own ideas again on the subject! This short diversion seemed to help her make up her mind however, and Jasmine then took her first step, with my Mother, towards the hay. This was then the moment for the Monty Roberts Join Up procedure when the horse is touched and stroked all over and the physical connection is strengthened. Jasmine accepted this calmly and relaxed visibly (see pictures below). Then the ultimate completion of Monty Roberts Join Up took place when she followed my Mother happily and willingly, to the hay. She seemed to eat in a more gentle, easy way also - in contrast to the almost angry way she used to eat. 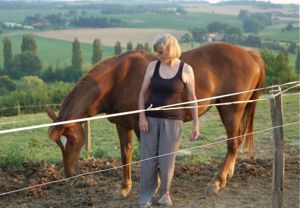 This series of photo's shows the various different stages of interaction between handler and horse. With a difficult or complicated horse, when you are at the stage of the Monty Roberts Join Up procedure when the horse has to make the tough decision to give in to you and trust you as their leader, or not, all of your movements, and the timing of them, become very significant. 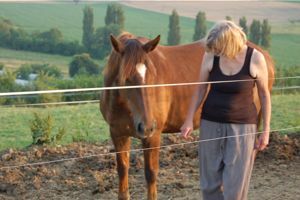 This is the pivotal moment where you are effectively energetically channeling the horse towards making a new choice instead of staying with old habits. In this case, at this point in the process, it was very important for my mother to be in the specific place in relation to Jasmine, where she could prevent her from ducking past her to get to the hay, at the same time as being able to allow Jasmine to follow her when she walked forwards towards it. This point was right at Jasmine's shoulder, between her and the hay. 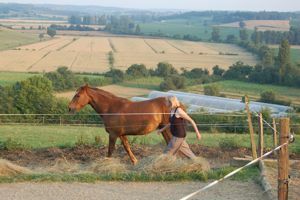 She then had to alternate carefully between taking a step towards the hay, to see if Jasmine wanted to follow (positioning herself at an inviting angle), and then making Jasmine yield back again if she went to go past on her own, without joining-up. Between these actions were periods of waiting patiently for Jasmine to make her own decision. 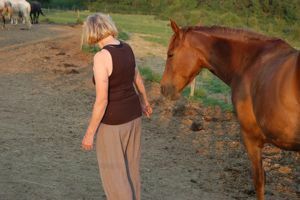 The timing of what you do is crucial, because it is in response to the signals the horse is giving you: the subtle energetic signs of her either being ready to make a connection, or sticking with her lack of trust. 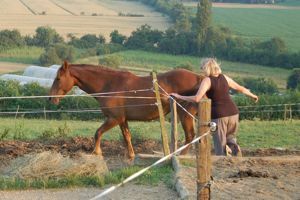 With a reluctant horse who has trust issues towards people, if you get the timing or positioning wrong, you will very probably cause the small window of opportunity between you and the horse to close again. It's all about using your intuition to guide you, really trying to connect with how the horse is feeling, and responding accordingly. Of course the more experience you acquire using the Monty Roberts Join Up method, the more opportunity it gives you to develop this intuition, but you have to put your focus on heightening your awareness of the energy dynamics of each individual situation. Although the process of the Monty Roberts Join Up has not contributed anything directly to Jasmine's gymnastic training, the profound shift that it has created in her relationship with people will provide a new basis for her dressage work to progress. 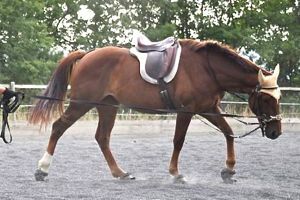 It will help her to accept the physical demands that her rider places on her towards the goal of engagement, as well as making all of her interactions with people more pleasurable. This is why it is so important to keep an open mind towards different training techniques and solutions with horses, no matter what your chosen area of specialization.